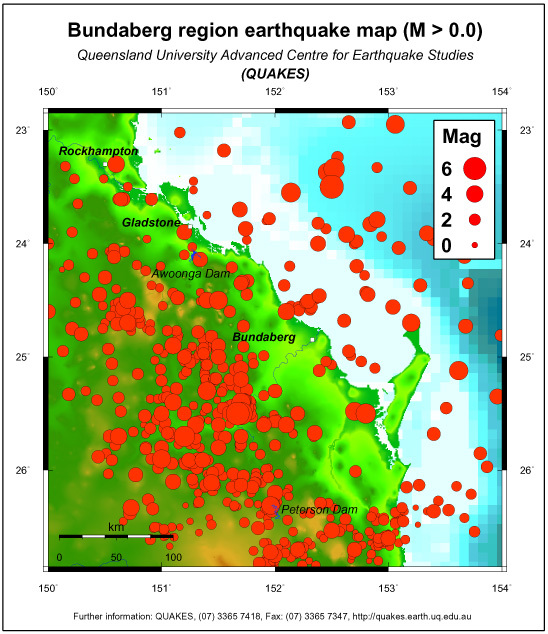 The Queensland catalog contains a total of 1099 earthquakes in the Bundaberg map region. Shown here are Richter magnitude ML > 0 events. The map shows a high level of seismic activity in the map area, particularly running through a belt just inland of Bundaberg spanning downwards from Gladstone through Gayndah and beyond. The closest moderate sized recent earthquake struck about 40 km from Bundaberg in 1985 and had a Richter magnitude of 3.1. There are no earthquakes on the map within 20 km of Bundaberg which is at least partially due to there being no seismographs in Bundaberg and too few nearby to detect any smaller more frequent earthquakes in the town vicinity.